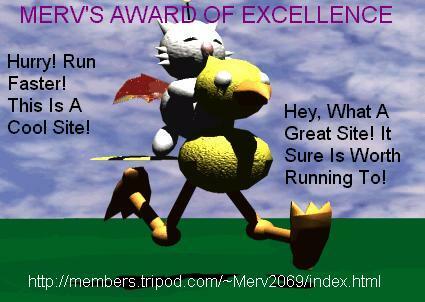 This is an award I created. It is available to all. All you must do to recieve it is email your URL to the address below. Below it is a list of links of the pages who have won my award and their ratings. Enjoy! Solace Software: 12/12 Tons of free homemade HTML editor and other program downloads! Nocturne Of Sephiroth: 12/12 Personal Homepage with Sephiroth Scream, Highlander, and more! Frank's Page: 6/12 Has great links, downloads, and a whole lot more! Star Trek - The Philliprise: 10/12 Has great Star Trek Stuff; Interesting Navigation. Dreamfire Central: 10/12 A Great RPG Resources Page! The Unofficial Zelda 3 Page: 11/12 The Best Zelda 3 site on the web! Super Mario RPG: 6/12 A Great Super Mario RPG Site! Weeve 73's Homepage: 7/12 An all around great site about video games, TI-82 games, and more! The Homepage of the Moogle: 8/12 Has info and original pics of Moogles, as well as Emulation. Ally's PokeIsland: 11/12 A great Pokemon site! Zelda 64 Site: 6/12 A new Zelda 64 site. Nice effort! Video Game Codes: 7/12 Has some Codes and FAQs on N64 and Playstation games. The "NEW" uVw! : 9/12 A Great General Video Game Site. Firstborn Dragon's RPG Hoard: 10/12 A Great RPG Site. Final Fantasy Downloads: 11/12 A Fantastic Final Fantasy Site. Leanne Maree Richer's Web Comix: 11/12 A Great Original Comicbook Site. Link's Ocarina: 7/12 A Nice Zelda 64 Site with Nice Content. World of Super Mario RPG: 8/12 An Awesome Site About an Awesome Game. Zelda Tech/The Electronic Poke Center: 6/12 A Pretty Nice Site on Zelda 64, With a New Pokemon Section. Mistress Quistis's FF VIII Palace: 6/12 A Nice Personal/FF8 site. Chrono Chross Palace: 4/12 12 year old Joey's shrine to this great game. Cesca's Homepage: 10/12 An Italian Site featuring FF7 & FF8, and a LOT more. MonzurWorld: 6/12 A personal site from India. Trillium: 12/12 Has personal thoughts, Winamp skins, fanart, and lots of other cool stuff. Sonic's Stop: 9/12 Anything and Everything Sonic the Hedgehog related. The Home of SCW2: 10/12 Another super Sonic site! Webzbox: Final Fantasy Collection: 7/12 A Final Fantasy VIII site with a little more! GreatFinalFantasyShrine: 9/12 A Really Nice Personal and Final Fantasty related site! Ryan's Final Fantasy Shrine: 5/12 A Good Site, but is still being worked on, Score will increase when done! Super Mario RPG Player's Site: 10/12 A Great Site for this Great Game, Constantly Being Worked On. NICE JOB! Diablo's FFX Site: 12/12 THE BEST FINAL FANTASY X SITE ON THE NET!!! The Bronze Comic Club: 12/12 The Most Complete Buffy the Vampire Slayer Comics page Imaginable! The Ultimate Green Lantern Website: 11/12 The Name Says It All! GAMEWIZKID's Super Mario RPG World: 10/12 A Great Site with More Work to Come! Watler's World: 7/12 Anything and Everything Video Game Related! :+: Star Fantasy :+:: 10/12 Contains next to everything on Star Ocean, Final Fantasy VII, Sonic the Hedgehog, an under-construction DragonBall section, and tons more stuff! CrOnO2K's RpG PaGe: 7/12 Chrono Trigger, Final Fantasy VII, Super Mario RPG and MORE! Mario Mania: 6/12 A fairly new Mario RPG site whose score will increase as it develops. Be sure to check it out!! !